Manufacturer of a wide range of products which include submerged arc welding machine. Machines with the best process for high deposition, radiographic quality welding at minimum cost. Most suitable for structural designs, ship building, pipe fabrication etc. Available in wide ranges from 600A to 1200A for different welding applications. Available in both versions carriage mounted and boom mounted. Unique electronic current control unit provides stable arc and low spatter. Swivel Adjustment 360 degree of the beam supporting control box, wire spool & Welding head. Angular Displacement 45 degree transverse / parallel to seam. 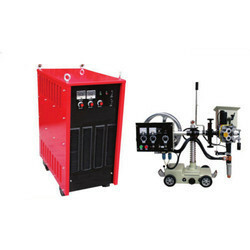 Looking for Submerged ARC Welding Machine ?